I Can Fly—Was among the five envoys from Ballydoyle who made their first appearance on the dirt track on Thursday morning a little after 7:00 a.m. as the worst of the morning rain cleared. The quintet remained in single file throughout with the experienced traveller Hunting Horn (Longines Dubai Sheema Classic) leading Lost Treasure Al Quoz Sprint sponsored by Azizi Developments, Van Beethoven (UAE Derby sponsored by The Saeed & Mohammed Al Naboodah Group) and the fillies Magic Wand (Dubai Sheema Classic) and I Can Fly. The group walked one lap right-handed and gently cantered a circuit left-handed. “They have settled in well since arriving late Monday night or early Tuesday morning. Not a bother on any of them,” said Matt Gleeson, part of trainer Aidan O’Brien’s travelling team. Of each horse’s wellbeing, Gleeson continued: “Magic Wand is in good form. She should run well. Hunting Horn has got plenty of air miles already this year, but we think he can run a good race. I Can Fly travelled well; happy with her. Lost Treasure has loads of ability and we hope the track is fast for him on Saturday. Lord Glitters—Big-race jockey Danny Tudhope was aboard the grey has he went around the turf training track just after 8:00 a.m. in preparation for the race. Trainer David O’Meara, who arrived in Dubai overnight, head lad Colin Bolger and owners Geoff and Nick Turnbull watched the work. Southern Legend—Trainer Caspar Fownes was delighted to have drawn the inside post for Saturday’s race, although he admits the Hong Kong galloper still has something to find if he is to beat Japanese superstar filly Almond Eye. Fownes says that Southern Legend, who began his career in Australia as a juvenile before shipping to Hong Kong midway through his 4-year-old season, has relished getting away from the Sha Tin stables he has called home for the last two years. Purton, whose only ride aboard Southern Legend produced that three-length Kranji Mile (G1) victory, arrives in Dubai having ridden a double at Happy Valley on Wednesday night. Without Parole—Trainer John Gosden watched Without Parole, his Royal Ascot-winning entry for the Dubai Turf, at Thursday morning exercise for the first time since his arrival in Dubai and liked what he saw. Ridden by his regular work rider Maurizio Varju, Without Parole had the synthetic Meydan training track to himself as he completed a circuit at a steady canter. The original plan was for the 4-year-old son of the great Frankel to work at 5:00 a.m. over the turf course, but the prospect of rain, which did indeed materialise, prompted a change of mind. “We decided not to go on the turf because the training surface takes the rain very well,” Gosden said. Without Parole, who has not run since early September, is following the same programme as Dar Re Mi and Jack Hobbs, who were unraced in the seasons when they provided the stable’s two previous winners on the world’s richest single raceday. Cheval Grand—Cheval Grand went to the paddock to school at 5:00 a.m. in preparation. The Japan Cup winner will be making his first international start this Saturday in the Longines Dubai Sheema Classic (G1). Desert Encounter—Another day, another change of exercise routine for UAE-owned, Newmarket-trained Desert Encounter as he continued his preparation on Thursday. Dodging the rain showers, he completed a circuit of the Meydan dirt track under regular work rider Katie Reed shortly after 7:00 a.m. as he went around at a steady canter that delighted trainer David Simcock. Three previous mornings had been occupied with one and two laps of the dirt circuit and a very early spin over the turf course, but Simcock stressed that no great significance should be attached to the variety of the 7-year-old’s work schedule. Old Persian—Trainer Charlie Appleby is confident that Old Persian has continued to progress on the back of his victory in Super Saturday’s Group 2 Dubai City of Gold Sponsored by Emirates SkyCargo. The 4-year-old had a gentle spin around Appleby’s Marmoom dirt track this morning and will be running on Saturday ahead of a European campaign when he takes in some of the best 2400m races. Rey de Oro—Japanese contender Rey de Oro went out early this morning onto the turf course to stretch his legs after his breeze yesterday. Suave Richard—Suave Richard cantered a half a lap around the Meydan dirt track this morning before schooling in the gate. Fight Hero—Trainer Me Tsui is under no illusions about the tough task facing his stable star but he is hopeful that his enigmatic gelding can upstage a strong American contingent. Hong Kong has won the Dubai Golden Shaheen once before, with Sterling City taking the title for John Moore in 2014 when the event was on Tapeta. However, Dubai World Cup Carnival stalwart Rich Tapestry, placed in the event twice on both Tapeta and dirt, gave the predominantly turf jurisdiction a first dirt Group 1 when taking the Santa Anita Sprint Championship that same year. Since the Hong Kong season started in September, Fight Hero’s best effort from four runs has come on foreign soil. That was in the Korea Sprint, a Korean Group 1 at Seoul in September, where he finished with a flourish for a head second to Japanese galloper Moanin. He also had to overcome a deep draw, something he will face again on Saturday from the outside gate of 10. Joao Moreira will take his first ride aboard Fight Hero, one of five rides for Brazil’s ‘Magic Man’ on the Dubai World Cup card. Imperial Hint – Trainer Luis Carvajal Jr. continues to be quietly confident in Imperial Hint as he watched the horse gallop strongly Thursday morning. “I’m very happy with how he’s been training since he arrived here,” Carvajal Jr. said. Promises Fulfilled—Grade 1 winner Promises Fulfilled was unfazed by the wet conditions as he turned in his routine gallop under the watchful eye of trainer Dale Romans. Never shy about touting his horses, Romans had nothing but praise for what he saw from Promises Fulfilled as he went about his business under exercise rider Heather Smullen. 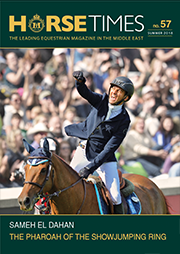 Romans knows a thing or two about success on this side of the world, having saddled Roses in May to victory in the 2005 edition of the Dubai World Cup sponsored by Emirates Airline. Tato Key—Trainer David Marnane issued another positive bulletin regarding his sole Dubai World Cup night runner, Tato Key. The 4-year-old continued his daily routine of cantering just over a lap of the Meydan dirt track shortly after 7:00 am on Thursday. Tato Key was drawn in post 8 for Saturday’s race and Marnane is happy with the position. 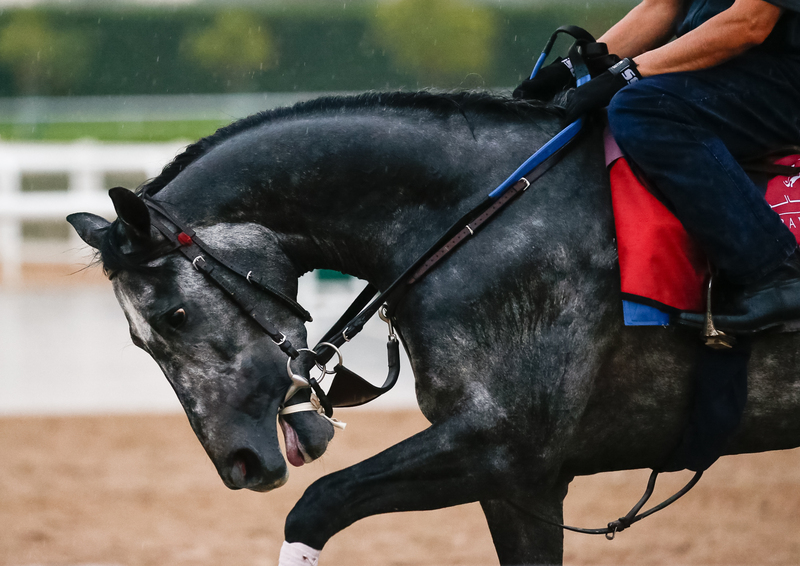 X Y Jet—X Y Jet continued to impress during morning trackwork for trainer Jorge Navarro and owners Rockingham Ranch and Gelfenstein Farm. The 7-year-old Kantharos grey trained over a wet Meydan dirt on Thursday just after 7:00 a.m. under exercise rider Anthony Cruz. A runner-up in both the 2016 and 2018 renewals of the Dubai Golden Shaheen, X Y Jet arrives at the 1200m test from a romping 7 ¾-length score on a sloppy Gulfstream Park. X Y Jet drew post 3 with fellow American trainees all around him. Navarro said X Y Jet’s speed and experience at Meydan will be a distinct advantage on Saturday. Divine Image—The winner of three of her four career starts has come forward again since her wide-margin success in the Listed Al Bastakiya according to trainer Charlie Appleby. Divine Image pleased Appleby in a spin on the grass on Wednesday and this morning had a gentle jog around his Marmoom stable's dirt track in preparation for Saturday’s $2.5 million UAE Derby (G2) sponsored by The Saeed & Mohammed Al Naboodah Group. “She is a work-in-progress filly,” Appleby said. “She has not been the sharpest from the gates but she is just inexperienced and has been maturing away. On her last start against the colts she had a low draw and got out and got racing and got into a nice rhythm. I do think she has improved again since that night. “The key about her is how she finishes her races and sees it out well. That’s one of key attributes and I think she is going to be a strong player on Saturday evening. Gray Magician—For the second consecutive day Gray Magician underwent light training in the stable area rather than come out on the track. “At this point they’re all fit. At this point all I can do is screw them up by overdoing it,” said Peter Miller, who trains the son of Graydar trying for his first stakes score. Jahbath—William Haggas was on hand to see His Highness Sheikh Hamdan bin Rashid Al Maktoum’s colt for the first time this week, along with the owner’s representatives Angus Gold and Richard Hills, and they gave him a stronger blow-out than the light cantering that he has been undertaking for the last few days. Big-race jockey Jim Crowley was in the saddle. Plus Que Parfait—During the decade he spent in Dubai working as an assistant and exercise rider on the Godolphin team, Brendan Walsh held fast to the idea in the future he'd be a trainer in his own right and return to compete on the Dubai World Cup card. Dreams do come true. Jose Ortiz, North America’s champion rider in 2017, was on track Thursday morning for the first time in his career and picks up the mount. “He felt really good today. I think he fits really good in this spot and has a good chance,” said Ortiz after he got Imperial Racing LLC’s colour-bearer for the first time and they galloped once around the track and went to stand in the gate. Stubbins—The Doug O’Neill trained UAE Derby contender was loving the rain when he came out on Thursday morning where he jogged on the dirt track at Meydan. Walking Thunder, Superior, Golden Jaguar—Thunder, lightning and heavy rain meant that Ahmad bin Harmash had to delay Thursday morning’s work programme for Walking Thunder, Superior and Golden Jaguar, his trio of runners, by half an hour. All three were bought at last year’s Ocala Spring sale of 2-year-olds in Florida by Allessandro Marconi, bin Harmash’s assistant. Walking Thunder, the cheapest at $42,000, is the most experienced and most successful, so far, having won his first three races before finishing second to Estihdaaf in the UAE 2000 Guineas. He will be ridden for the first time by Frankie Dettori, after stable jockey Connor Beasley opted for Superior, a $50,000 purchase who has won one of his three races but is untested beyond Listed company. Superior was beaten a little over seven lengths into second place behind the filly Divine Image, who re-opposes in the UAE Derby, last time out, but Beasley is hopeful of bridging the gap on Saturday. “I was happy with that last run because, as I say, he’s still learning and maybe we went to the front a little too soon,” he reasoned. Golden Jaguar, bought for $60,000 after changing hands for $90,000 as a yearling, is the mount of Oisin Murphy, who opened his score at the Dubai World Cup meeting at the 10th attempt when Godolphin’s Benbatl landed the Dubai Turf sponsored by DP World (G1) a year ago. Golden Jaguar graduated from winning a small 1000m race at Jebel Ali on his January debut to take the Meydan Classic Trial by two lengths, before going down by a neck to Sporting Chance in a driving, four-way finish to the Classic itself. Belvoir Bay and Stormy Liberal—With trainer Peter Miller looking on early Thursday morning, two-time Breeders’ Cup Turf Sprint winner Stormy Liberal required repeated persuasion to enter and stand in the gate during his schooling session. Miller also hoped that his charge would draw the outside post in the 13-horse field but Stormy Liberal, the runner-up in last year's edition of the race, will break under Joel Rosario from post 1. “It is what it is. You can’t change it,” he said. “At this point they’re all fit. At this point all I can do is screw them up by overdoing it,” he said. Blue Point—After two easy wins at Meydan in recent weeks, trainer Charlie Appleby believes Blue Point will hard to beat in a race he was withdrawn at the start 12 months ago. The 5-year-old had a gentle canter around the dirt track at Marmoom this morning and the trainer bel his recent start in the Nad Al Sheba Turf Sprint sponsored by Arabian Adventures will be to his benefit. “I have been delighted with his two starts here winning the Meydan Sprint over 1000m on his first start and then stepping up and winning the Nad Al Sheba over 1200m,” Appleby said. “They were two great performances and I am pleased I gave him the second run. I had planned to go straight to Dubai World Cup Night after his first run but he came out of his first run so well so the decision was made to get another run under his belt. Illustrious Lad—It’s been a life-changing month for journeyman jockey Anthony Darmanin, but the down-to-earth rider hopes it is not over yet as he aims for more glory. The 36-year-old Darmanin, who rode his first winner in 2001, almost gave up riding a decade ago, disillusioned by a lack of opportunities. However, earlier this month, he managed to snare his first Group 1 win with rags-to-riches Tasmanian filly Mystic Journey in the Australian Guineas, before backing up two weeks later with the same horse to take out the inaugural running of the rich All-Star Mile, both over the Flemington 1600m. Darmanin made his Dubai World Cup night debut 12 months ago aboard Illustrious Lad and hopes that the Peter Gelagotis-trained gelding can run as well as he did last year, when he was the first Australian home in fifth. Sands Of Mali—Trainer Richard Fahey arrived in Dubai on Wednesday and watched the Group 1 British Champions Sprint practice in the starting stalls at 5:20 a.m. Sands Of Mali went once into the stalls, came back out and went in again before going off down the back straight. The Right Man—A lover of soft ground, the connections of The Right Man were hence happy to see the rain fall on Thursday morning. His trainer Didier Guillemin was on hand. Viddora—Took to the Meydan turf on Thursday morning, two days after a rousing gallop over the course she will tackle on Saturday However, she was given an easy time under raceday rider Joe Bowditch, loping along in the shadow of the Meydan grandstand—a far cry from her native South Australia. Viddora will jump from gate 12 in the 13-horse field, one of three Australians in the line-up. Wishful Thinker—Throughout the week, one consistent factor on the Meydan dirt track has been the slow, methodical work of Wishful Thinker, in company with his stablemate Gold Mount. However, on Thursday morning, the Richard Gibson-trained Wishful Thinker was asked for a little more – still not much quicker than evens, but enough to show that he’s on track. Alexis Badel, who formed a nifty association with Wishful Thinker during his winter stint in Hong Kong, flies in from France to take the mount. Call The Wind—As usual, the Freddy Head trained Dubai Gold Cup sponsored Al Tayer Motors contender was brought onto the dirt track by a pony but then did a steady canter by himself. Cross Counter—Trainer Charlie Appleby believes the Melbourne Cup (G1) winner is peaking at the right time as the 4-year-old nears his seasonal debut. Most of Appleby’s runners have had an outing at the Dubai World Cup Carnival, but Cross Counter arrives here a fresh horse and had light exercise at Marmoom this morning. “It is his first start since the Melbourne Cup and his first of 2019 but he looks great,” Appleby said. “This is his first start of the year and we have along year ahead of us, but there is no doubt about it – he has been back on his A-game the last 10 days. Gold Mount—More than a decade after Doctor Dino put Richard Gibson on the map as a prodigious traveller of horses, the trainer is grateful to be globe-trotting once more. Gibson moved from his Chantilly base to set up shop at Sha Tin in 2011. He found early success with the likes of Akeed Mofeed and Gold-Fun, but he has not had a runner outside Hong Kong since Gold-Fun went amiss in the Prix Maurice de Gheest (G1) at Deauville in 2016. Owner Pan Sutong, who tasted Group 1 success with both Akeed Mofeed and Gold-Fun, also has Gold Mount, a one-time Royal Ascot winner when named Primitivo. Gold Mount was given an easy time of things in the rain at Meydan on Thursday, barely breaking a sweat in a gallop under former Czech jockey Tomas Vraj. “He’s right where you’d want him ahead of him trying a new trip,” Gibson said. Prince of Arran—Trainer Charlie Fellowes was on hand the first time this week to watch the 6-year-old do trackwork. The son of Shirocco was out on the track just after 7:00 a.m. partnered by regular work rider Natasha Eaton. Sharpalo—At the age of seven and with a total of 30 races behind him, Sharpalo will be tested over 3200m for the first time in the Dubai Gold Cup. Even 2400m, the distance of his last four outings, in which he has arguably produced his best-ever form, was at least 200m farther than he had been asked to race until two months ago. Sharpalo is by the top-class stallion Shamardal out of a mare who won at up to 2400m, and trainer Ahmad bin Harmash is encouraged that the French-bred gelding has the requisite stamina on the evidence of his most recent run. Tackling Group 2 company for the first time since he was well beaten over 1900m at Meydan in February 2018, he finished fifth, three and a half lengths behind Old Persian, in the Dubai City of Gold on Super Saturday. Coal Front—The 5-year-old son of Stay Thirsty was able to dodge the rain that hit later in the morning, coming out first thing at 5:00 a.m. and galloping once around the Meydan dirt track under Amelia Green in preparation for the Godolphin Mile sponsored by Mohammed bin Rashid Al Maktoum City—District One. With regular rider John Velazquez staying behind in the States, Coal Front is set to have Jose Ortiz in the irons for the first time this Saturday. Logrado—Erwan Charpy expects his Grade 1-winning recruit from Argentina, who was seventh in his Dubai debut in the Al Maktoum Challenge R3, to be more likely to be a talking point in the 2020 Dubai World Cup Carnival. True Timber—Calumet Farm’s Grade 1-placed True Timber will be seeking his first career stakes win on Saturday. The Kiaran McLaughlin trainee, being cared for in Dubai by McLaughlin’s brother and assistant, Neal, took to the Meydan dirt at 7:00 a.m. in the midst of a persistent rain. True Timber, a 5-year-old son of Mineshaft who will be piloted by Joel Rosario, drew post three.